When you think of the Hippies, you probably think of an embrace of the aesthetics of primitivism; teepees, feather headdresses, patchouli, and communal living. Yet, strangely enough, they were also some of the first to celebrate the technology that would eventually become the personal computer – an odd object of worship for communalists. What could explain the paradoxical coupling of primitivism and futurism that thrives in alternative communities? The principles developed on hippie communes went straight from the counterculture to our tech culture. It’s as if they were mainlined into the mainstream through fiber-optic cable –- or at least, through Stewart Brand, the visionary that linked the first computer hackers with their long-haired Merry Prankster counterparts. Contradictions are part and parcel of the counterculture, just as they are of any movement. This makes it difficult, but not impossible, to understand how so many opposing forces can coexist in the same time and place. If we’ve learned anything from the 60’s, it’s that set and setting are key to making sense of it all. While they seemed radical at the time, the Hippies, like many revolutionaries throughout history, were following in the footsteps of a long tradition of alternative thought – a peculiarly American tradition, one rich with defiance of both custom and logic. That’s the setting for this story. From colonial days as a “city shining upon a hill,” to foreign adventures exporting the gospel of democracy, this strange land has always served as a breeding ground for utopian and salvific thinking. 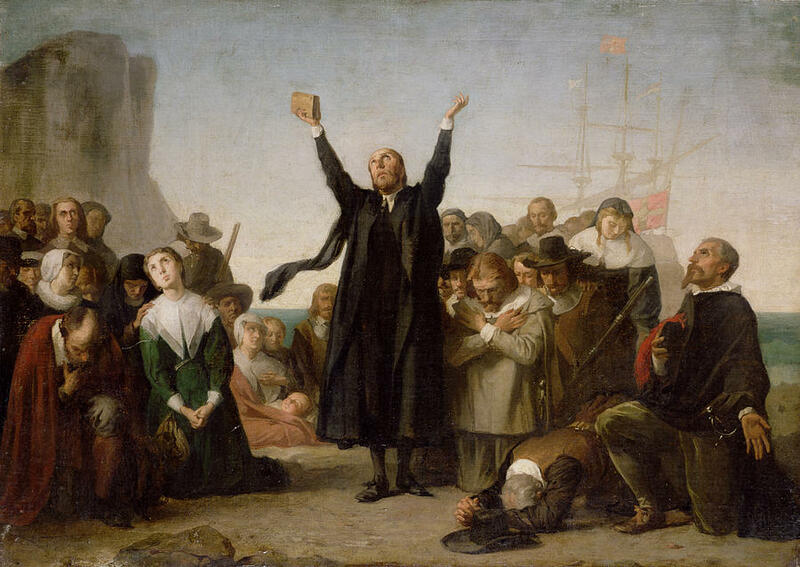 When the Pilgrims settled in the New World, they proclaimed it a place of pilgrimage, holy ground. Maybe that’s why here in the USA, you can never quite know if a sign is really a symbol, if the tramp down the street is a wandering preacher, or if your neighbors believe the Earth is 6,000 years old and possibly flat. It’s 2018, and the world’s wealthiest nation doesn’t practice separation of church and state, and not coincidentally, it’s still debating the theory of evolution. It’s not just religiosity that sets this nation on its strange pedestal. Americans have an odd habit of bringing spiritual zeal to topics that would be merely intellectual or artistic on any other continent. In few cultures do purely secular pursuits, such as veganism or practicing yoga, demand such complex devotion from their adherents. Yet a quick walk down this country’s memory lane is all it takes to find obsessions that are more than obsessive, crazes that, while crazy, carry with them a glimpse of the beyond. Which is why the counterculture movement of the 1960’s and its colorful progeny may be ground zero for anyone interested in innovative applications of religious themes. It seems no matter the decade, sacred geometry, holy crystals, shamans of all kinds, and ritualized psychedelia make regular appearances, across Hippie, Burner, raver, and New Age gatherings. It’s as if some sort of supernatural gravity draws spiritual feelings out and into the open in these alternative spaces, whether futuristic or primitivist. Cue Calico, and its godly research into a technology that will rid us the problem of death by making us immortal – see, we’re still in it. To those on the outside, all of this must seem absurd, and in a way, it is. It’s as if Americans look up and see different stars than the rest of the world. The camp meetings, festivals, caravans, carnivals, and pilgrimages that mark America’s history and hallow its ground may just be the most extreme example of the liberation promised, and never quite delivered, by the continent. In these concentrated communities, cut off from the default world, people have quite literally pushed freedom to the limit in their pursuit of meaning, fellowship, and a good time. Perhaps it’s not surprising that many of them serve as a microcosm of the country itself, often embracing all the paradoxes that hitchhike across the nation like a sore thumb on the Interstate. If there is a place where these energies can be seen today, it is everyone’s favorite festival to make fun of, also known as Burning Man, which evolved from the Hippie, New Age, and Electronic Dance Music movements. The annual festival brings upwards of 70,000 people into a sandy, dried-up lake bed, where they build a city, populate it with art, and set the art on fire. While the late founder, Larry Harvey, asserted that the gathering has no fixed meaning, he also described it as a “primal” affair, one where people can be themselves without any of the strappings of civilization. It is curious, then, that night sees the entire event lit up by neon lights, and techno can be heard 24/7. Could there be something primal about technology? That depends on who you ask. The Amish, another peculiarly American culture, would likely disagree. Primal societies had to be community-oriented before advanced technology because there was simply no way to get anything done without the help of neighbors and extended family. For them, community itself was the technology. Many hippies could get down with that sort of thinking – at least in theory. As counterculture leader and current President of The Long Now Foundation Stewart Brand puts it, “The Hippies were romantically anti-tech.” They embraced Native Americans, camped in teepees, and railed against rule by technocrats. Yet for all that, they loved amplified guitars, “high-tech drugs like LSD, and eventually personal computers.” For the Hippies, primitivism didn’t preclude futurism. Critics have been less generous to the counterculture. Researcher Gina Fatone wonders if attachment to the primitive is just an attempt to, “hold on to the human element in the face of pervasive, ever-expanding technology while reveling in the hedonistic aspects” of both past and future. It’s certainly fair to say that hippies have a hedonistic streak, and hedonism is easier to swallow with a mushroom cup of tea. In America, it’s all too easy to add religious flavor to a drug-fueled bender. Yet for all that, technology does freak lots of people out even as it makes their lives easier. The digital realm is wild, inhuman, and growing like a virus. Its acceleration of both urbanization and globalization may well be responsible for our latest anti-establishment political circus. It’s no wonder that people seek some shred of solid truth amidst this change – whether that be in raw food, jade eggs, Cryogenics, or in primitivism. Perhaps the hidden tragedy in all of this is that creative types feel more at home as they conjure up the past than they do in their own civilization. Temporary party zones could just be fleeting spaces for the misfit toys to gather in. Maybe we’re grown so accustomed to the storybook reality of television that whitewashed caricatures of tribal life have replaced the grittiness of tribal histories. Or maybe the human mind is doomed to project our vision of perfection onto the unseen to help us cope with daily life. Some of those images, like the tribal yearnings of hippies or the nationalist myths of American history, deal with the past. Others, like the perceived freedom of cyberspace and the promise of the Global Village, deal with the future.